Sitting in my university’s library last spring, I was procrastinating on studying for finals by browsing Facebook—something any college student can relate to. In between the endless feed of news articles and photos, one event caught my eye: a three-part discussion series, “South Asians for Black Lives.” The Facebook event listed some incredible speakers and activists who would be talking about important issues such as the model minority myth and colorism in South Asian communities, which both affect whether and how South Asians choose to stand in solidarity with Black communities (or not). Although we had really wanted to attend the discussion series, logistically it wasn’t very feasible to do so. Talking with my friends who expressed an interest in the event, we decided if we couldn’t go to “South Asians for Black Lives”, we would bring “South Asians for Black Lives” to us. That is, we would basically copy that event and hold it on UChicago’s campus instead. There were some important differences, though. Our university’s South Asian Students Association was robust, but focused more on cultural and social events, like the annual spring show and chai socials. When it came to programming related to social and political issues, there wasn’t a whole lot. My friends and I weren’t sure what kind of response we’d get from our campus community—would anyone even show up?—so we decided to make our event a one-day affair, instead of Northwestern’s three-part series. We reached out to professors, activists, and fellow students from the UChicago community and the greater Chicago area as well, and invited some really incredible, passionate speakers. Finally, it was the day of the event. Although there were some minor hiccups, everything went quite smoothly. After a panel discussion with two activists and allies of the Black Lives Matter movement, we moved into small group discussions led by members of UChicago’s Organization of Black Students and other student activists. Although the theme of our event was geared towards South Asian students, quite a few students from different Asian backgrounds attended, as well as students of other ethnicities. Afterwards, my friends and I were frankly surprised by the overwhelmingly positive response we got from those who attended! Many of them expressed that they would love to see more events focusing on social and political issues relating to Asian-American communities on campus. 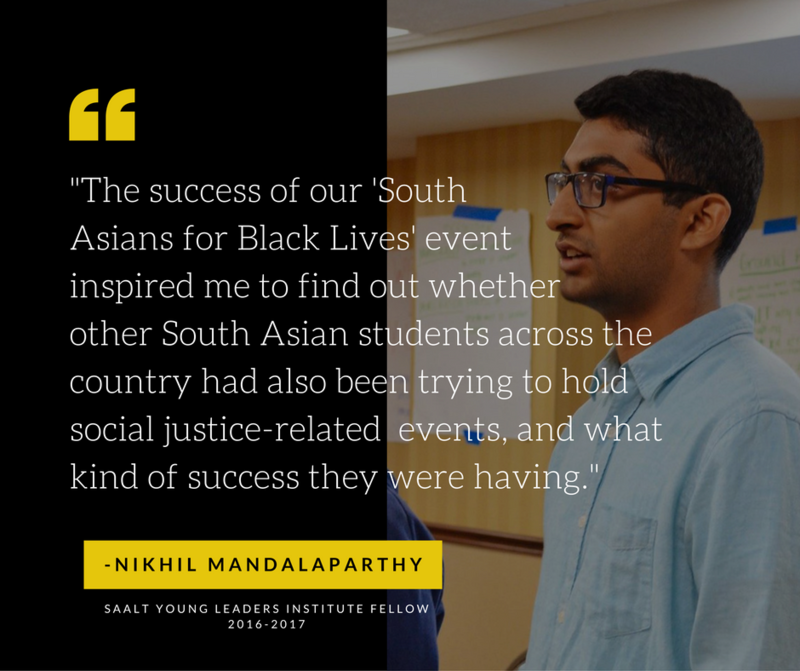 The success of our “South Asians for Black Lives” event inspired me to find out whether other South Asian students across the country had also been trying to hold social justice-related events, and what kind of success they were having. While looking online, I stumbled on SAALT’s Young Leaders Institute (YLI) webpage. YLI seemed like exactly what I was looking for: a group of young South Asian Americans who were passionate about social change. By the time I found out about YLI, it was just a day before the application deadline, but I managed to send my application in anyway (a couple hours late). Thankfully, I got in! The YLI training in DC was eye-opening in a variety of ways. It seemed like every member of the cohort felt like their colleges’ South Asian student groups also didn’t focus that much on social and political issues as much as cultural events. The theme of this year’s YLI was Immigrant Justice, and after hearing about the different projects we were hoping to execute on our campuses, I was honestly in awe of everyone else. We learned about the current immigrant right issues facing our communities, we heard from activists and organizers, and we had some very honest and important conversations. For me, one of the most meaningful moments of the YLI training was finding out that the project that originally inspired my friends and I—the “South Asians for Black Lives” event at Northwestern—was actually organized by a member of the 2015 YLI cohort, Sanjana Lakshmi! One could say this was just a coincidence; Sanjana’s event just happened to show up on my Facebook feed one afternoon. However, I think it was more than just a coincidence. It was proof that our efforts to have these important conversations in our communities can have a much greater impact than we could ever imagine. I’m sure that in the coming years, as each YLI cohort works to tackle a variety of social and political issues in their campus communities, their work will serve as inspiration to many more young South Asian Americans, just as it did for me. This entry was posted in SAALT Spot Blog, Young Leaders Institute by SAALT. Bookmark the permalink.